These are indeed troubled times for the Montreal Alouettes. They've lost six straight games and appear destined to miss the playoffs for a fourth straight season. It's been a quick fall from grace for a club that long ruled the East Division and was one of the CFL's model franchises. They've lost six straight games and appear destined to miss the playoffs for a fourth straight season. It's been a quick fall from grace for a club that long ruled the East Division and was one of the CFL's model franchises. "[Owner] Bob Wetenhall did a great job of helping to save the CFL and the Alouettes and I was just so proud to play a role in it," said Larry Smith, the former Als player and CFL commissioner who later served as Montreal's president. "It troubles all of us who had anything to do with the CFL, no matter what position, to see the Alouettes and the plight they're in today." Much of that success came with Anthony Calvillo as the starting quarterback. Signed as a free agent in 1998 after being released by the Hamilton Tiger-Cats, Calvillo first served as Tracy Ham's backup before taking over the reins two years later. Calvillo went on to become the most prolific quarterback in CFL history, leading Montreal to a Grey Cup win in 2002, its first in 25 seasons. Two more championships followed (2009-10) and three times Calvillo was named the league's most outstanding player. Calvillo suffered a career-ending concussion in a 24-21 loss to the Saskatchewan Roughriders on Aug. 17, 2013. When he retired in January 2014, Calvillo left as pro football's all-time passing leader (79,816 yards) and was inducted into the Canadian Football Hall of Fame three years later. Following his retirement, Calvillo became an assistant coach with Montreal, serving as a receivers coach, quarterbacks coach and offensive co-ordinator from 2015-17. He's currently a quarterbacks coach in Toronto on former Alouettes head coach Marc Trestman's staff. Since its 21-18 Grey Cup win over Saskatchewan in 2010, Montreal has compiled a 55-80 regular-season record. The Alouettes haven't been to the playoffs since losing 40-24 to Hamilton in the '14 East final. What's more, Montreal is 17-46 since that playoff loss and finished last in the East in 2015 and '17. While Calvillo was instrumental in the Alouettes' on-field success, Smith was a pivotal figure behind the scenes. He oversaw the relocation of the Baltimore Stallions to Montreal as CFL commissioner in 1996 before becoming team president the following year. Smith, currently the leader of the opposition in the Senate, wasn't afraid to roll up his sleeves while with Montreal. He made over 200 appearances annually throughout Quebec promoting the Alouettes brand. There was also consistency on the Alouettes' active roster with such players as Calvillo, slotback Ben Cahoon, offensive lineman Scott Flory (both Canadians) and kicker Damon Duval. Montreal's lineup also featured a number of francophone players like running backs Eric Lapointe and Bruno Heppell, receiver Eric Deslauriers and safety Etienne Boulay, to name a few. "In 1972 [Smith's rookie season with Montreal], about 16 of us came into the Alouettes," Smith said. "Guys like Junior Ah You, Dickie Harris, Wally Buono, Don Sweet, myself, Dan Yochum, Carl Crennel, most all of us played between seven and 10 years with the Alouettes. "We had the same faces, we knew each other, we trusted each other and we created that winning environment." And it worked. During Smith's tenure in the front office, Montreal registered 105 straight sellouts at Molson Stadium, which has a seating capacity of roughly 23,500. "The connectivity to the community was very strong tool," Smith said. "In Montreal you must have a great product but you also have to have the connectivity with the two types of communities. "There's a community of business people, which Bob did a great job with his relationships. The second thing is we had the connectivity in terms of the population." When Smith was with the Alouettes, he'd meet two or three times weekly with Wetenhall, who purchased the Montreal franchise from Jim Speros in 1997. Wetenhall's son, Andrew, has taken over as lead governor but still consults with his father on major decisions. The franchise also was a little fortunate as in 1997 a U2 concert at Olympic Stadium forced the Alouettes to look at McGill as a potential venue. Trouble was, Molson Stadium wasn't exactly in pristine condition and even had a tree growing in the stands. Montreal also had front-office stability with Jim Popp, who served as GM/football-operations director from 1996-2016. Popp is entering his second season as Toronto's GM, building a Grey Cup-winning team in 2017. But for all of his success, Popp couldn't find a suitable replacement for Calvillo. Antonio Pipkin started Montreal's 40-24 road loss in Edmonton on Saturday night, the 16th different quarterback to start for the Alouettes since Calvillo's injury. Montreal is 32-60 since Calvillo's last game. And Pipkin became the fifth different starter and sixth quarterback to play for the club this season (Drew Willy, Jeff Mathews, Matthew Shiltz, Vernon Adams Jr. and Johnny Manziel). "I think that [no replacement for Calvillo] is one key element, there's no question because you have to have the general," Smith said. "But you have to make sure you have a team that stays together. "When you look at our run from 2000-10, we had many of the same names that made their careers with the Alouettes and the turnover, in my mind, has been an issue in this latest seven-, eight-year period. If there's any good news right now, it's they probably have three young quarterbacks with tremendous upside with Manziel, Adams Jr. and Pipkin." Trestman left after the '12 season to become the head coach of the NFL's Chicago Bears. Montreal has had six head coaches since, including Popp twice (2013, 2015-16). The others include: Dan Hawkins (2013); Tom Higgins (2014—2015); Jacques Chapdelaine (2016—2017); Kavis Reed (2017); and Mike Sherman (current). "They [problems facing Alouettes] can be fixed, absolutely," Smith said. "The issue is, right now, how do you do it? "A lot of thinking needs to be gone into this thing and it starts from the ownership right on down." Manziel missed another practice on Wednesday, meaning he's all but certain to miss his second game in a row with the Montreal Alouettes on Friday. The former Heisman Trophy-winning quarterback was placed in concussion protocol last week after suffering an injury on Aug. 11 in Ottawa. 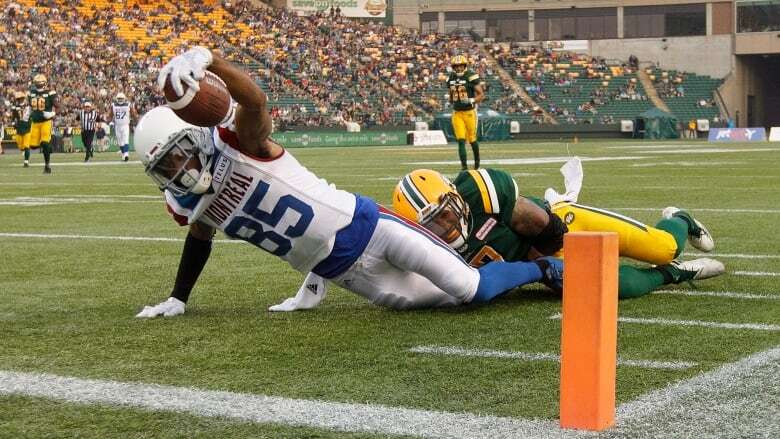 He has not been on the field for either of the Alouettes' two practices this week. Last-place Montreal (1-8) has a walkthrough Thursday before a home game against the Toronto Argonauts on Friday. Antonio Pipkin took first-team reps on Wednesday and is expected to start Friday. Alouettes coach Mike Sherman expressed hope that Manziel could return to the field on Thursday. "He's doing better every day," Sherman told reporters. "I texted him last night (and) he said he felt great. Every day, there's an improvement. Hopefully tomorrow there's significant improvement and we go from there."